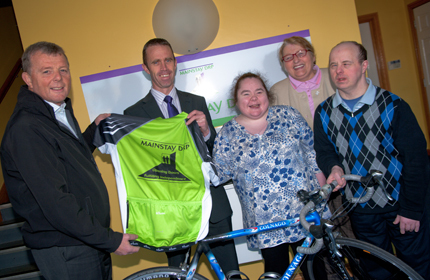 MAINSTSAY DRP in Downpatrick is looking for cyclists to join in their charity ride in sun-kissed Majorca next April to help reach their £3.7 million target to build a new centre for adults with learning difficulties. The spirit of Christmas is all about the spirit of giving. In the hustle and bustle of the festive season, it is the gifts from the heart that are most cherished. It is a time we can all be thankful for what we have and give to those that are less fortunate than ourselves in any way we can. Fintan McGrady and Philip McCrickard, Mainstay DRP supporters, along with Service users Emma McMullan, Betty Thompson and Simon Johnston help promote the appeal for riders to join the five-day Majorca charity cycle. In April 2013, 25 supporters will give their time and energy for the benefit of others by completing a challenging sponsored cycle for local charity Mainstay DRP. Why not join them and give something back to your local community? A five-day cycle ride around the beautiful island of Majorca next April will help raise funds for a new, purpose-built centre for people with learning disabilities and autism. A total £3.7m is needed to build the centre, in Downpatrick, and the Majorca cycle ride will be part of the final push to reach the fundraising target by Spring 2013. Jim Mulholland, Mainstay DRP Executive Officer, said: “The charity had chosen Majorca because of its reputation as a dream island for cyclists.